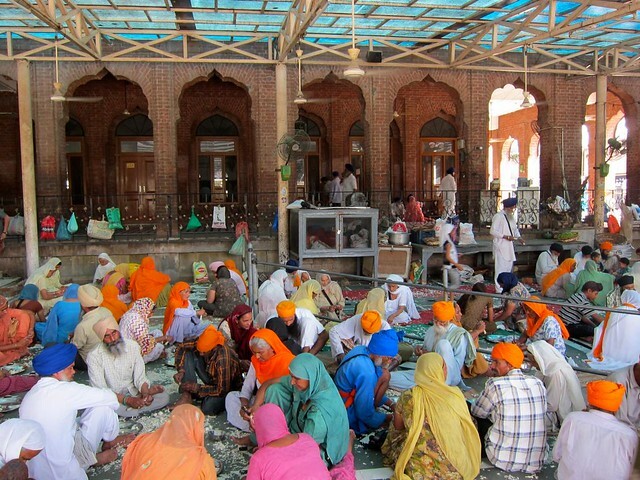 A temple for everyone in Amritsar – snackettes. Standing at edge of the pool surrounding the Golden Temple feels like standing in one of the most peaceful places on earth. Sikh gurus broadcast chilling chants that reverberate across the temple complex, people kneel and bathe in silent worship at the water’s edge, the setting sun’s reflection dances across the pool in a dazzling show of purples, oranges, and pinks. Indeed, there is something about pilgrimage sites that is so calming and beautiful, if not down-right fascinating as outside observers (and we’ve sure seen a lot of them on this trip). Never have I spent 5 straight days visiting one single temple, as we did at this one (except for maybe that week of Vacation Bible School way back when…) – especially one that is not even part of my own religion! 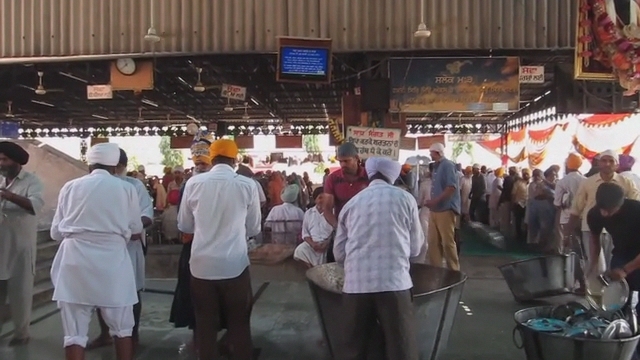 Being the holiest site on earth for members of the Sikh religion, pilgrims from around the world flock here to worship in the temple and hear their gurus read from the original Guru Granth Sahib (the Holy Book of Sikhism). The temple itself is also truly remarkable: a three hundred year old structure made of white marble, completely plated in gold, made even more beautiful by the body of water that surrounds it. To accommodate the thousands of people who visit here every day, the Sikhs have set up free dorm rooms in which people can stay, and they run a dining hall that serves free food nearly 24 hours a day (except from 2AM-6AM, when they serve only tea). Even non-Sikhs are invited to take part in the accommodation and free meals and are graciously welcomed into the temple by followers. On our first day walking around the Golden Temple complex, we met a guy named Montit while we all storing our shoes at the complex’s entrance. Montit took us under his wing, asked about our time in Rajasthan (he had traveled to the temple all the way from Jodhpur, like us) and showed us how to line up to receive meals at the temple. On the way, he told us that the dining hall is run completely by volunteers, Sikhs offering their time to their holy temple, which they are expected to do for one week at least once in their life. At the mess hall, we were given metal plates from an older man wearing a beautiful purple turban, a small bowl, and finally a spoon from an adorable little kid who was all too excited to be handing out spoons to foreigners. We filed inside the main mess hall with hundreds of other people, where we sat on the floor on small woven rugs in long rows. As the volunteers began walking down the aisles serving up food, we got a quick run-down of the whole process from Montit– giving me mere seconds to place the small bowl I had received off to the side before my plate got hit with a huge dollop of lentils! Volunteers walked by carrying large pots of dahl, boiled beans, sweet rice pudding, and water, which they slopped onto our plates (and our toes if we weren’t careful!) one person at-a-time down the line. One man came by carrying chapatti (unleavened bread), which we were told to accept by holding out our hands in front of us near our foreheads and taking it as an offering, as it was thrown forcefully down into our hands (with a big smile). While we were eating, Montit told us more about Sikhism. Sikhism is a monotheistic religion, and although it is the 5th largest religion in the world (! ), the vast majority of Sikhs (~75%) live in Punjab state (which is perhaps why the religion was so foreign to us). He told us that Sikhs must carry or wear 5 specific “articles of faith” with them at all times: uncut hair (usually concealed in a turban), a wooden comb, a steel bracelet, a dagger, and special underwear… (some articles are more practical than others). These rules are not just regarded as symbolic – several times I saw an old woman’s sari move aside to reveal a sword on her hip! I also got a glimpse of the “special underwear” several times, mostly on little boys going for a swim – from what I could tell, it consists of a white string that wraps around the waist with a loin cloth type covering in the front. The food at the med hall was delicious, and I spent my time savoring every bite of mine – that is until I noticed the huge mop aiming right for me as it plowed down the line of people, already cleaning up for the next group of diners! The mop man was followed by the squeegee man and a hoard of new diners, and we quickly lifted our plates, finished our meals, and handed our dishes to the dishwashers (who wash the plates 5 times, we were told! …But with just water, we think…:)). Even saints don’t weasel out of dish-duty…. On our way out of the mess hall, we noticed about 50 people sitting on the floor that we hadn’t noticed before – they were more volunteers, peeling mountains of garlic and slicing piles of chili peppers for that evening’s meals. As I watched the holy men sitting next to the saint, I suddenly noticed that their lips were moving precisely with the chanting that we were hearing (and had been hearing 24 hours a day for the past week) – the music had been LIVE the whole time! Unfortunately, the inner temple was extremely crowded, to the point that I got worried about being trampled or suffocated, and we didn’t have time to watch the guru or the singers for long. The temple itself was beautiful, but we only entered it one time during our entire week hanging around the temple complex. The thing we enjoyed the most about being at the complex were all of the friendly, curious people who came up to speak to us while we wandered around the grounds – people who just seemed excited to see foreigners at their temple, practice their English, ask us where we were from…. Many of the women wanted to shake my hand, and countless people asked to take our pictures. Whenever a seat would open up across from us while we were eating, someone would actually get up from where they were sitting and snag it so that they could watch whatever we did from head-on! To be honest, we felt like minor celebrities! Deciding that my signature wasn’t permanent enough, he and his friends later caught up with us after we had walked away and asked Scott to sign his 10 rupee bill! One of my favorite minor-celebrity moments was when a plump, older women walked up to me, smiled, and shook my hand. Deciding that wasn’t good enough either, she proceeded to then pull me in for a huge bear hug. All I could do was just laugh as she embraced me. All she could do was laugh back, too. Outside of the temple, we found plenty else to occupy our time in Amritsar. One of the most interesting things we did was visit two Hindu temples, which did their best to stand out in spite of the Sikh-dominated town they were in. The first Hindu temple we visited was….drumroll please… The Silver Temple! (I can’t make this up….) It was an exact replica of the Golden Temple, but smaller and far less ornate, and this time Hindu rather than Sikh. Why someone decided to construct a temple that would surely be directly compared to the world-class temple across town was beyond us. (I can just picture the architect unveiling his new design to his colleagues.. “Voila!! !”) Despite the unfortunate, unavoidable comparison, the temple was interesting and certainly unlike the other Hindu temples we had visited. The cutest part of all the temple twin-mania, though? 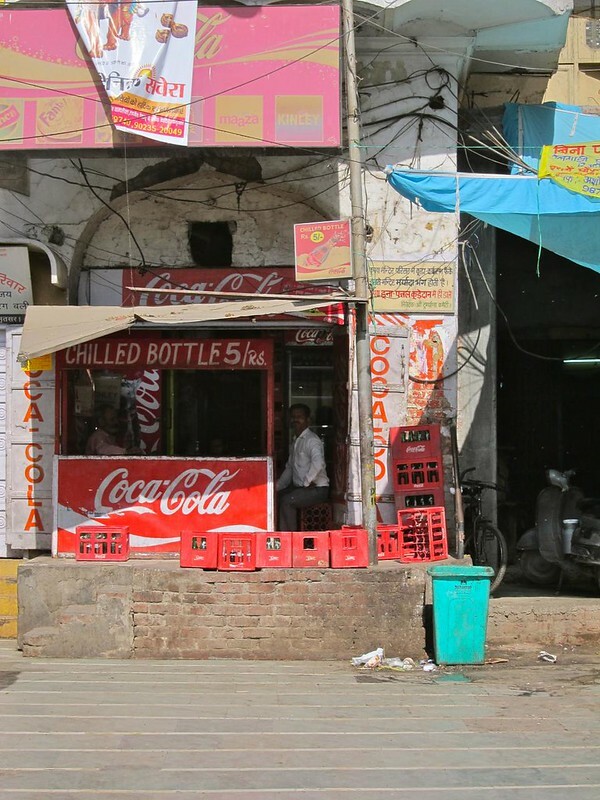 Like its larger Sikh sister temple, the SIlver Temple also served 5-cent Cokes to the temple-goers, which was something we had also been enjoying at the Golden Temple (again, another subsidized item that the temple has set up for its pilgrims to enjoy their journey to the temple). Next, we took a visit to Mata Lal Devi Temple, a Hindu temple dedicated to a female saint where women wishing to have children come to pray (no, that is not why I went, Mom). After 7 months of touring around Asia, we agreed that this might have been our favorite temple so far…(though the Golden Temple was a close-second). 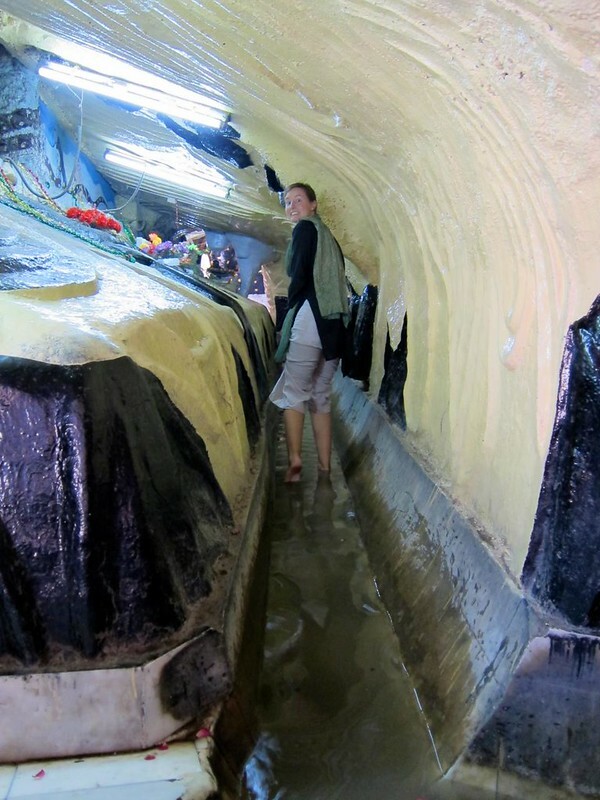 Mata temple, which was more like a psychedelic funhouse than a holy place, consisted of a labyrinthine, cave-like path that gradually worked its way to an inner temple where the shrine to Lal Devi was held. Along the way, the path twisted, turned, passed through calf-deep water, led into distorting mirrors, passed through tunnels, banked at sharp angles…all while passing by countless (disturbing) shrines and giant sculptures to various deities, illuminated in colored lights. On our final night in Amritsar, we visited the temple one last time, but we were disappointed that we couldn’t find Montit at the mess hall to say goodbye–maybe he had finished his week of volunteering. As we were waiting for our train out of town, we met a group of people who were (again) excited to speak with some foreigners… When they said that they had been visiting Amritsar for the weekend, I asked the girl my age, “Oh, is your religion Sikh?”, to which she answered that she was. We both hesitated, not sure what to say next. She held up one finger. “One God,” she said, smiling.